Virgin Atlantic launched its Little Red brand for domestic flights in March, first to Manchester and then to Edinburgh and Aberdeen. Operated by all-economy Airbus A320s wet-leased from Aer Lingus, the aircraft feature Virgin livery while crew wear Virgin uniform. Little Red serves Manchester four times daily, Edinburgh six times and Aberdeen three times. I arrived at Aberdeen International Airport at 1105 and quickly moved through security ahead of the scheduled departure time of 1155. On this return leg (for a review of the outward journey, click here), this involved showing my printed boarding pass to a security official and then moving through the usual x-ray bag check. Aberdeen airport is small, hence my late arrival time, so within a minute or two I was sat in a coffee shop that doubles as the gate waiting area. Boarding began at 1132 with the first call for those with children, the elderly and those with disabilities. One minute later, a second call came, this time asking for passengers in rows 15-29. Two minutes after that at 1135, the remaining passengers in rows 1-14 were called up. Last boarding is 15 minutes before departure. The A320 has 29 rows configured 3-3, seating 174 (to see a seat plan, click here). Like the outward leg, I was sat in the front row, this time in seat 1C. There is more legroom, of course, and the table is stored in the arm. Again, the flight was quite empty — this time, about a third full, whereas on the outward leg it was at around 10 per cent capacity — so, as the front few rows were full, I moved to seat 19F once the plane had reached cruising altitude. It was located in one of many empty rows and had a more stable fold-down table attached to the seat in front. All seats are aubergine leather and have adjustable head rests and a coat hook. There is more legroom in the front row and in rows 12 and 13, where the midway emergency exits are located. However, choosing a seat in the middle will mean you’ll likely be last to receive a drink/snack as the service starts from the front and back simultaneously. Sit near the front to be the first to exit the aircraft. Avoid the back row as the seats cannot recline and are next to the rear toilets. We pushed back at 1151 and took off at 1200. Shortly after the seatbelts sign was switched off, a complimentary drink and snack service was served. Two trolleys were used — one starting at the front, the other at the back. Among the items on offer were apple juice, orange juice, various carbonated drinks, tea, coffee, wine, beer and various other alcoholic drinks. Like on the outward leg, I asked for a beer and was offered the choice of a Heineken or Tiger and opted for the former and a glass of water. Both drinks were served in a transparent purple plastic cup. A small 15g bag of Tyrrells “plane” crisps in a “little red” pack was also provided. A short while later, I was handed a small packet of Love Hearts sweets. 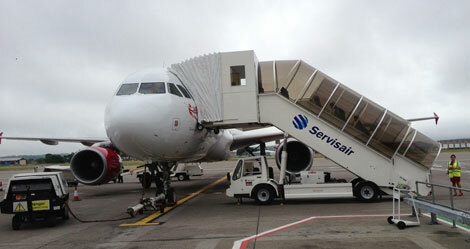 We landed at 1315 and taxiied to the gate, where we arrived at 1322, more than ten minutes ahead of schedule. Another pleasant flight with Virgin Atlantic Little Red, less than five months after this domestic service debuted. Perhaps worrying that the outward journey was only 10 per cent full, and the return about a third of capacity, but this is a welcome bonus for passengers on such flights. Again, cabin crew were friendly and attentive. PRICE Online rates for a one-way flight from Aberdeen to London in September ranged from £69.76 to £307.76 for a flexible ticket.